Weddings are special, particularly for the bride. It’s ‘the’ day she’d been waiting for, and now it’s almost time to embrace that encompassing wedding dress alongside the bridal jewellery. Thinking of which, have you ever thought how bland a wedding ceremony would be without those glittery jewels as part of the picture? In fact, a bride without her bridal jewellery can be metaphorically connoted as a dark sky without those shimmery twinkling stars. Makes sense? What I’m trying to say here is that to be able to pick the perfect bridal jewellery makes a whole lotta difference. And now that the market has grown humongous, with vivid jewelers offering extraordinary designs, it gets really difficult to decide as to what serves the purpose and what redefines the magnificence of the bride. 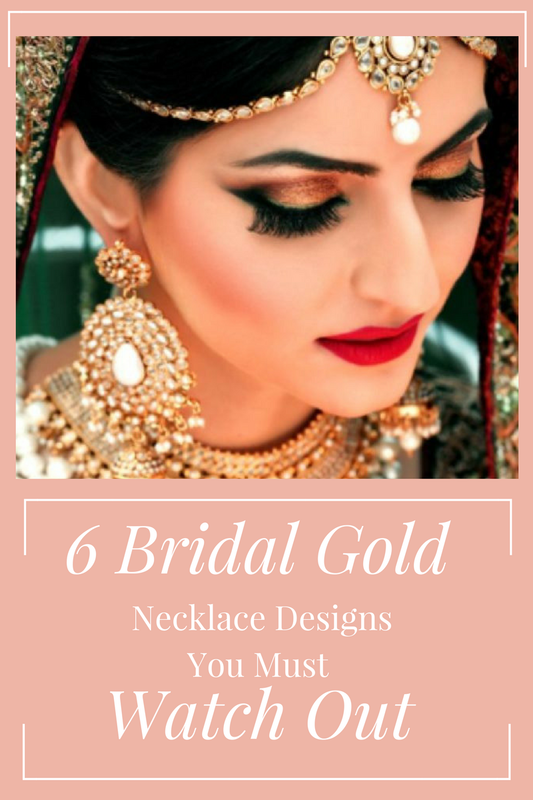 In this blog, I will present before you 6 latest bridal gold necklace designs and styles that you ought to watch out for prior to deciding what suits you the best. Out of all the traditional style jewellery you might come across, nothing matches the extravagance of Kundan jewellery. Even more, it also considered to be the most expensive traditional jewellery kind. Kundan jewellery comprises of multi colored gems embedded in highly refined 24-carat pure gold. This style of jewellery became popular during the Mughal Empire, and ever since, adorning a ravishing long Kundan necklace makes the bride feel royalty. Polki jewellery are quite similar to Kundan. However, it is the involvement of unfinished Diamonds and gems, that makes this style stand out amongst other designs. Traditionally, Polki jewellery originated in Rajasthan, adorned by the royal families. It is considered that Polki jewellery is even costlier than Kundan due to the presence of unpolished stones. Not to mention, when Polki jewellery is combined with enamel work, the overall essence of the jewel magnifies to a huge extent. If you’d ask your fellow married girlfriends, they’d surely have a lot to tell you about Polki necklaces! Any jeweller you go to will show you some extraordinary Polki designs that will definitely melt your heart. One thing that’ll never change is the bond between women and diamonds. In-fact, nothing can match the shimmery essence of diamond jewellery. Lately, Diamond is not only being presented as stand alone, but also being amalgamated with various forms of gold, like white gold, rose gold etc. It is this combination that adds an extra charm to the overall beauty of diamond jewels. Visit your favorite jewellers to take a look at their diamond necklace catalogue. Always impressive, Jadaau jewellery has a distinctive style that will never fail to add an extra spark to the bride’s charm. This style of jewellery originated in West India, particularly Rajasthan and Gujrat. Jadaau necklaces comprise of a beautiful uncut diamond, ruby, sapphire or any other precious gem as the center of attraction, embedded in gold. Trust me on this, a Jadaau necklace when adorned by the bride will make her look extremely elegant! Almost all the jewellers promote Jadaau jewels, however if you want to make things much special, you’d better visit Rajasthan or Gujarat to get your hands on the most exquisite Jadaau jewellery. If you have a thing for colorful gems and jewels, this one is just perfect for you. Meenakari style of jewellery originated from Rajasthan and lately it has become quite popular not only in India but around the globe. Under this style you get some fancy necklaces with beautiful motifs of peacock and flowers resonating different colors; totally apt for the bride! No matter what century we are a part of, Gold will always remain a bride’s favorite option. Always classy and elegant, purchasing gold necklaces is totally worth every penny you spend. As part of the Indian customs, Gold is symbol of Goddess Laxmi, even better known for its everlasting durability and shine. You can find vivid styles of gold necklaces, however make sure you purchase Hallmarked gold jewels from an authorized jeweller. Not to mention, gold has a great resale value too and it’s after care is also easy compared to other gemstones and precious items. Stay tuned for more interesting blogs discussing the latest GoldNecklace Designs for the year 2017.